My workshops are informative, with the opportunity for you to have fun, learn and paint. They have been enthusiastically received by students. The workshops are a good opportunity to experience new concepts and materials, yet build on your current knowledge. This workshop will lead you through the process of painting glass objects with all the intricacies of reflection and refraction. I will provide reference material in advance and full instruction as you proceed, but you will bring your own enthusiasm for tackling a detailed painting with an abstracted vision. Class size is limited to 8 students in my home studio. $65 per day with 10% reduction for both days. Between 1999 and 2005 I taught watercolour instruction courses to both beginners and advanced students at the Frederick Horsman Varley Art Gallery of Markham. There were three, eight weeks sessions per year during which students were taken from complete beginners to competency in techniques, design and colour theory. The advanced classes challenged proficient students to think creatively and improve their knowledge. Starting in 1999, I have been running successful classes in my home studio to students of varying levels, concentrating on students individual needs. Private lessons are also given. 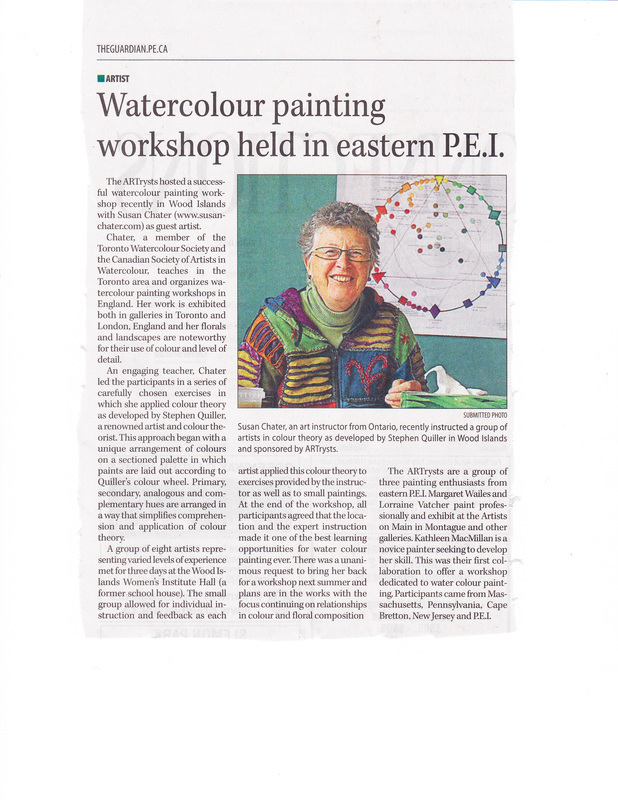 Since 2008 I have taught with the Town of Richmond Hill Adult Education Program, twice a week, including beginner, intermediate and advance watercolour classes. During the past five years I have been invited to jury local art group annual shows. Starting with a short lecture or demonstration, emphasis is placed on a specific topic of learning, such as colour mastery, value relationships, or creating a good, balanced composition. Hands on attention to individual student needs guides you in encouraging your own style and level or proficiency. A critique is given at the end of the day. Some of the art groups for whom I have given workshops are the Orangeville Art Group, Willowdale Group of Artists , Bayview Watercolour Society, Richmond Hill Group of Artists, Markham Group of Artists, and the North York Visual Artists.